Tonight was Pinewood Derby night for the scouts. 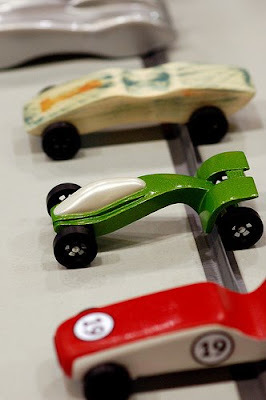 I had the general gist before we even started: dad's make the cars, kids race 'em. Best Dad wins. What I didn't expect was the lesson in losing. How do you tell your kid how to lose? I'm just a Den Leader, so that removes a lot of the emotional tension. I got to watch how things unfolded, and when it came to losing, I was most impressed with Ben. He made a car that was supposed to look like a Lamborghini. He added thin nails under the carriage to look like exhaust pipes and hand drew (badly) all of the lines on his car. When you turned it over there were weights and quarters taped along the bottom. Other cars had weights drilled and melted in for optimum balance and speed. Ben's looked awful - especially compared to the kid who is the 5th son of a sucessful businessman. That kid is a tremendous scout, and has more Boy Scout Bling per square inch than most of South Harlem. His car was professional, aero-dynamic, and had already had a paint job redo when the first one bubbled a little. I thought about why these dad's didn't want their kids to lose. If you win, of course, you don't have to feel bad the whole night. You just get more and more accolades as your car keeps placing in the top. You don't have to be gracious and turn to a victor, shaking his hand, to tell him "Good job." But, there was only one kid won the derby, everyone else got to learn in their youth how to be a gracious loser. "Go on, go shake his hand, tell him he did a good job!" said one dad. After it was over, I asked Ben about his car; "It looks like a Lamborghini..."
His eyes lit up, and I could tell that, outside of this competition, he knew he'd done a good job on his own, to make one fantastic car. Good job Ben. You taught me something tonight that makes you, in my book, the Grand Winner. You know how to lose with dignity, and not let it ruin your day, or change how you feel about your work. The other kid took home a ribbon and a shiney car, you took home a lesson that will serve you your whole life through. Awwwww. Sweet kid. I have to say, being in cubs has furthered my endearment for that particular age. I don't get why Dad's get in the mix, but they DO. It's like their son's car made out of PINE defines them. They just want to win and be better. Good job, Ben. You're a better person than most of those Dads! Good for Ben! I liked his car best.